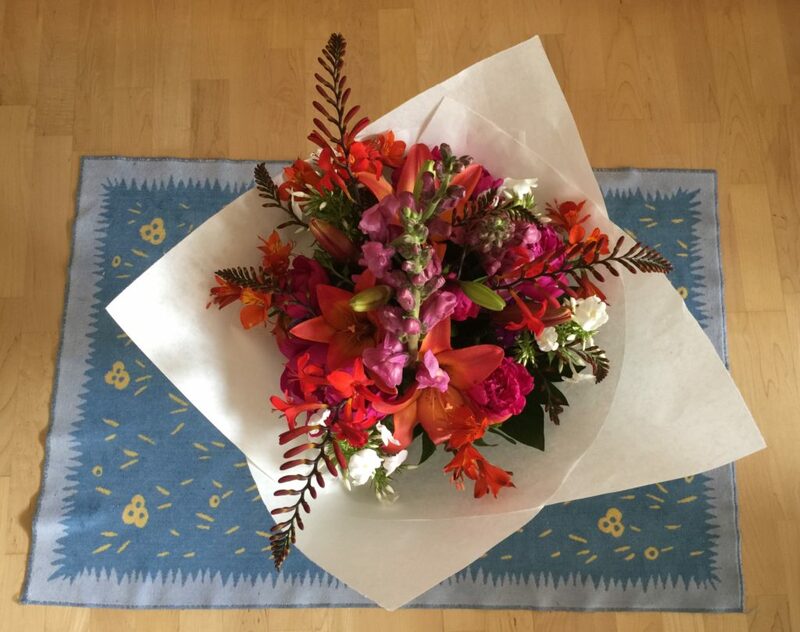 I bought my Week Twenty bouquet for the Bouquet-a-Week Project from Erlinda, one of the long-time and most talented designers in the entire Pike Place Market. Here she is proudly displaying the flowers I chose. 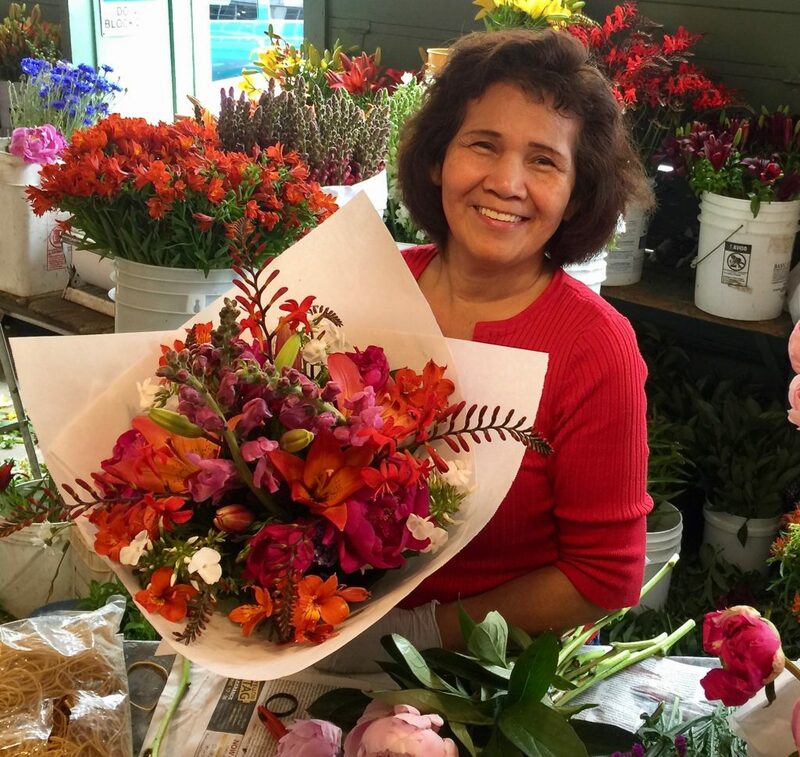 I’ve known Erlinda for years and always appreciate the fresh and clean bouquets she crafts at Flower Garden in the Pike Place Market’s Main Arcade. You can find Flower Garden under the Market clock, just a few steps away from Pike Place Fish (which tourists often refer to as “the place where they throw the fish”). 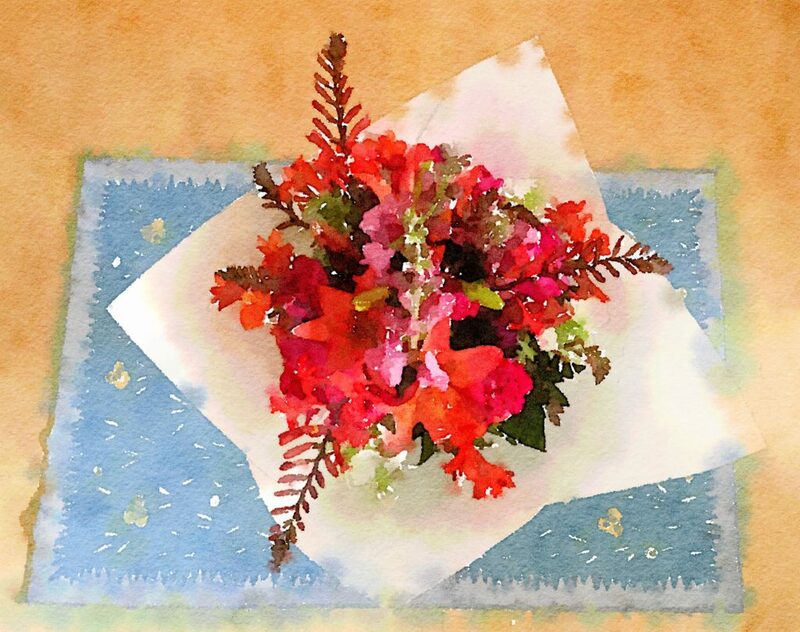 I was drawn to this lush bouquet, rife with vibrant contrasting colors, because of several “new” varieties of flowers. I use the word “new” loosely here, simply because the names of the “new” flowers were hitherto unbeknownst to me. More on the “new” varieties that I discovered thanks to the PlantSnap app later on in this post. Here is the fresh bouquet of Pike Place Market flowers that cost $15. 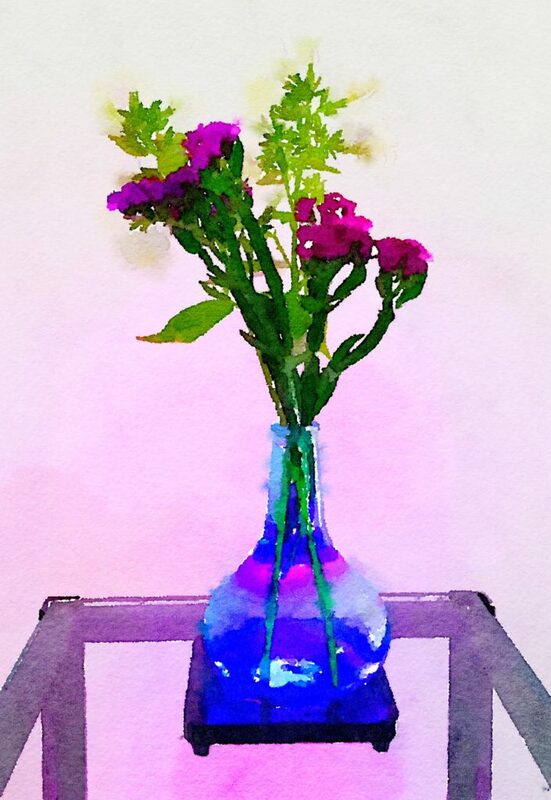 And here is the same bouquet “painted” in “Natural” mode using the Waterlogue app. This was not only a visually opulent bouquet, but it smelled great, thanks to the peonies and one of the “new” flowers I discovered on PlantSnap called Golden Arrow (Plumeria Pudica). 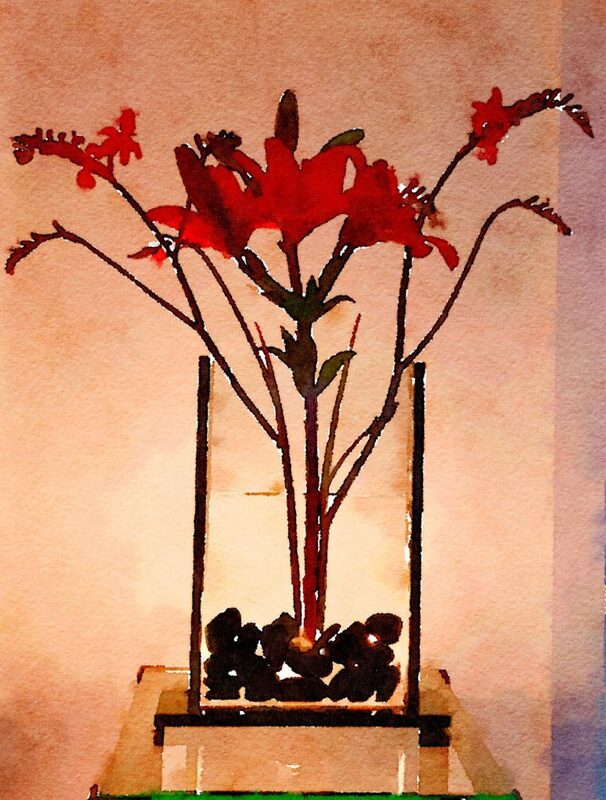 Here is the first major bouquet I created using the single orange Asian lily and two of the graceful Kangaroo Paws (Anigozanthos) positioned so perfectly in an Asian-leaning vase lined with smooth black rocks. Although I had worked with the lacy red flowers for years, I never bothered to learn their name until now. Good to know! Here is the same arrangement shot at night with ivory backlights. Magical! 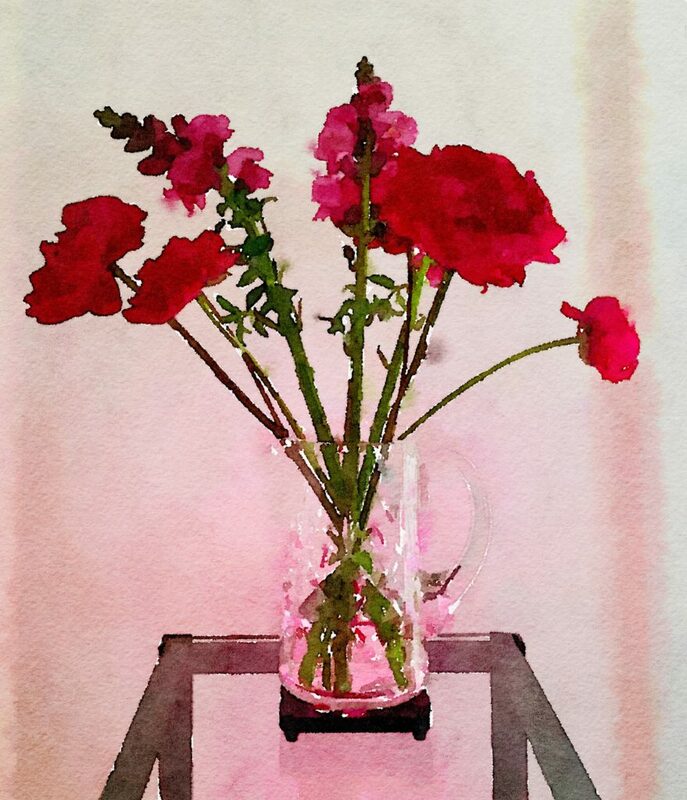 I knew that the dark-pink peonies and snapdragons would look pretty in a Waterford cut-glass vase. I love using this vessel because it was a wedding gift when my husband and I married 36 years ago. 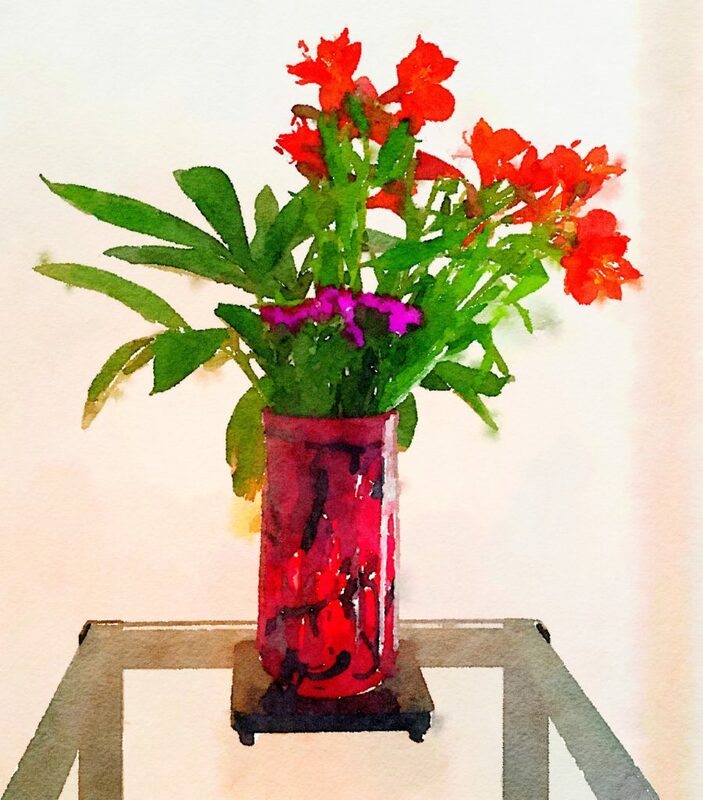 I really wanted to use this interesting art-glass vase in a muted burgundy color. 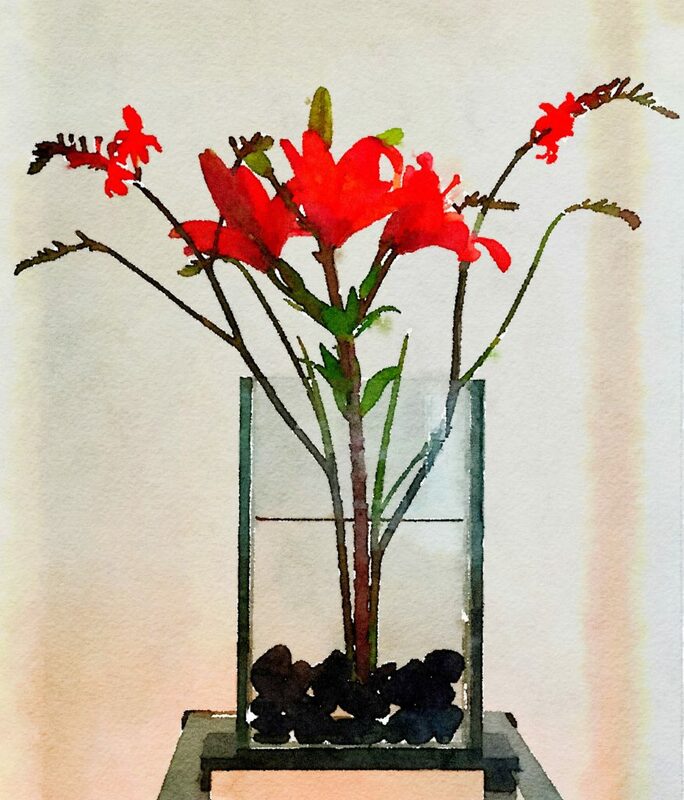 Orange canna lilies and purple flowers and greenery are so dramatic. My favorite blue Buddha vase backlighted in blue looks royal with the addition of White Golden Arrow and purple flowers. 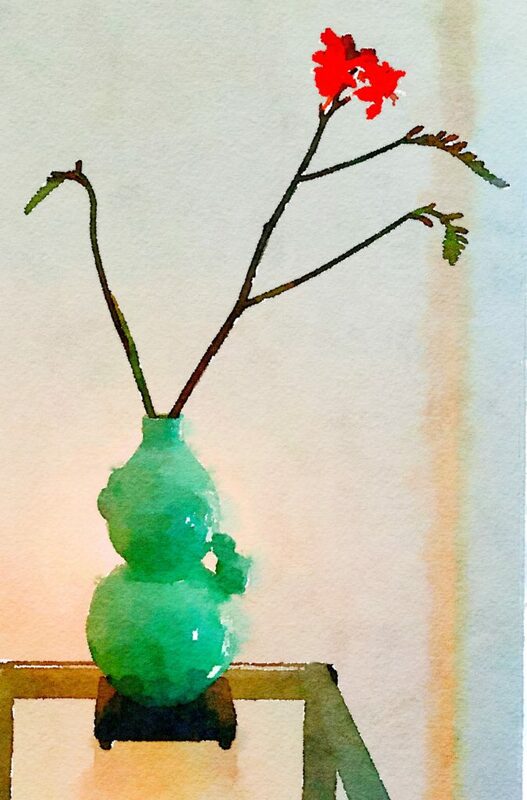 A single Kangaroo Paw in an Asian celadon vase is the spirit of ikebana. 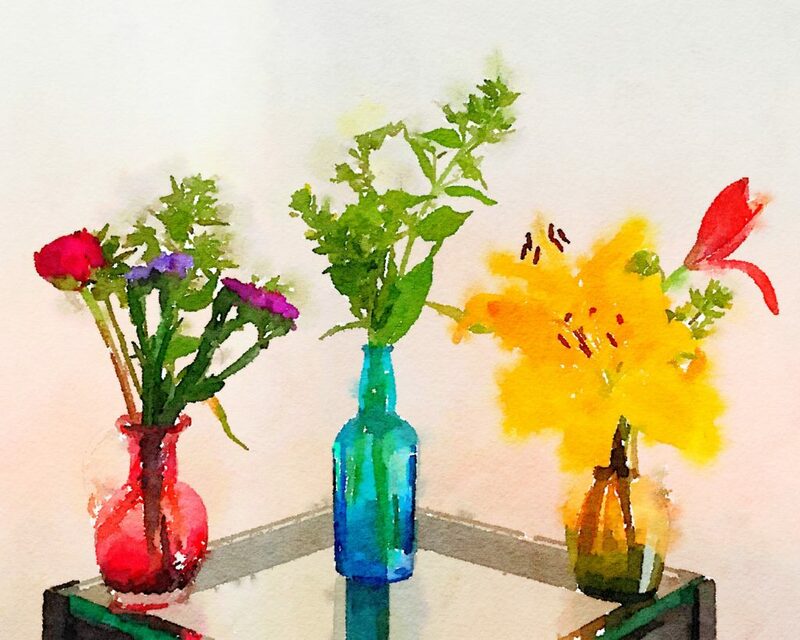 The three small vases for Week Twenty of the Bouquet-a-Week Project made use of a single pink peony, Golden arrow, purple flower, and a couple of lilies left over from Week Nineteen.